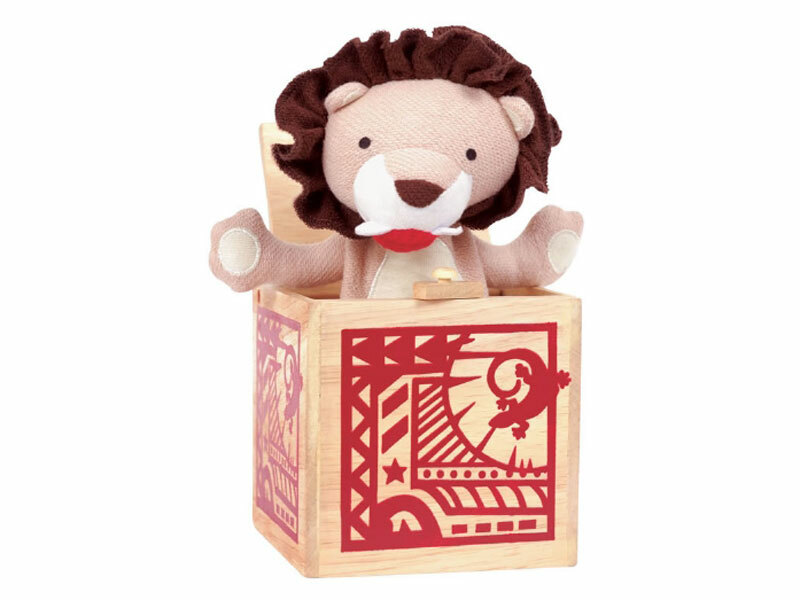 We love this classic jack-in-the-box style Pop-Up Lion from I Love My Plant Toys. Each lion is made in the USA using naturally sustainable rubberwood and organic cotton fabric. An intricate design is burned onto the wooden box making this a toy keepsake that will be treasured for generations to come. A part of the Jasper Jungle collection, this beautiful, vintage-inspired toy will stimulate your child’s imagination with a high-quality look that will make it the perfect accessory to any child’s bookshelf. We love this classic jack-in-the-box style Pop-Up Lion from I Love My Plant Toys. Each lion is made in the USA using naturally sustainable rubberwood and organic cotton fabric. An intricate design is burned onto the wooden box making this a toy keepsake that will be treasured for generations to come. A part of the Jasper Jungle collection, this beautiful, vintage-inspired toy will stimulate your child's imagination with a high-quality look that will make it the perfect accessory to any child's bookshelf.